Easy going and caring, Kirsten consistently exceeds expectations in her role, by ensuring that clients have a positive experience with Elders Real Estate. Her friendliness and honesty puts clients at ease, filling them with confidence as they navigate their real estate journey. Kirsten has industry knowledge and understands the daily demands of a our team, making her well suited to her role as an administrative assistant. Kirsten enjoys being part of a team and working together to achieve goals and targets. Outside of work, you will find Kirsten spending time with friends and walking her dogs. 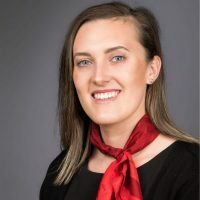 A valued member of the Elders Real Estate team, Kirsten looks forward to assisting you with your next property transaction. Would you like to speak to Kirsten? If you’re thinking about renting or selling your property and you’d like a clearer picture of how much your property might be worth or want to have an informal chat about general property market trading conditions, Kirsten will be happy to arrange a full market appraisal of your property.